According to one tradition among the Comerfords in Ireland, the branch of the Comberford family that became associated with Bradley in Staffordshire also intermarried with the Comerford family of Co Kilkenny, and their descendants in Ireland included the Comerford families of Danganmore, Co Kilkenny, of New Ross, Co Wexford, and of Athy, Co Kildare, as well as Edward Comerford, Archbishop of Cashel, and Joseph Comerford, who erected the Comerford memorial in the Comberford Chapel or North Transept of Saint Editha’s Church, Tamworth. The Comberford family of Bradley also lived at Brocton Grange, Forton, and Church Eaton, and they were closely intermarried with the Skrysmhire family of Aqualate. For a brief period in the 1650s, Francis Comberford (1620-1679), a parliamentarian magistrate, acquired an interest in Comberford Hall when his distant cousin, William Comberford, was using it to secure loans and putting the family’s ancestral home in the hands of trustees [see Comberford 5: Recusants, royal guests and civil war]. 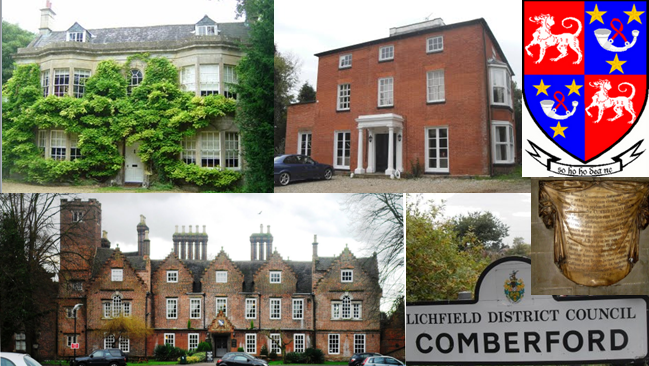 While he was living at Comberford Hall in 1655, Francis Comberford and his family became Quakers, one of the first Quaker families in the Lichfield and Tamworth area. 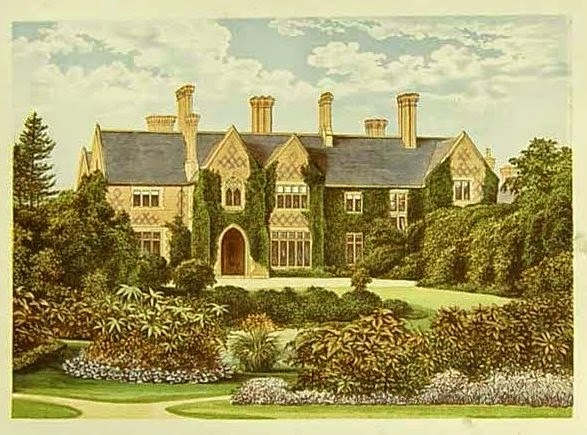 Comberford Hall was eventually recovered by Robert Comberford [see Comberford 6: ‘A family brought low …’], and Francis Comberford failed to establish his claims to the estates after Robert’s death. Eventually, Francis moved to Shropshire. His children moved to Stafford and Lichfield in Staffordshire, and became dispersed through Shropshire, Gloucestershire and Worcestershire, the family descended into obscurity, and their descendants cannot be traced beyond the end of the 17th century. (Judge) RICHARD COMBERFORD (ca 1512-post 1547), son of Thomas Comberford who died in 1532 [see Comberford 4: Comberford wealth from Wednesbury] and his wife Dorothy Fitzherbert, were the ancestors of the Bradley branch of the family. He was born ca 1512, and with his brothers Canon Henry Comberford and Humphrey Comberford, he was educated at Cambridge (BA 1534, MA 1537, Fellow of Saint John’s, 1534), and was the Senior Bursar of Saint John’s College, Cambridge, 1542-1544. A senior barrister, Richard Comberford was a serjeant-at-law or “servillus ad legem,” according to the Visitation of Staffordshire. He held one of the highest judicial posts as the King’s Remembrancer from about 1547. He was also a Ranger of Hatfield Close. 1, Dorothy, who married Edward Bulkeley. 2, Elizabeth, who died in childhood. 3, Francis Comberford, of whom next. 4, John Comberford, whose daughter Alice married Walter Littleton [however, see Comberford 4: Comberford wealth from Wednesbury]. Joseph Comerford’s pedigree registered in 1724, and the pedigree compiled at the College of Heralds in 1786 for the Countess of Crequy, make an even more fantastic claim, saying Richard moved to Ireland and became Lord of Ballymacken and Danganmore, Co Kilkenny, through his marriage to Mary, daughter and heiress of Allen de Comerford, last Baron of Danganmore, said to have died in 1504, and niece of Edmond Comerford, Bishop of Ferns, who died in 1509. 1, Thomas de Cumberford, who married Anne FitzGerald of the House of Kildare, and was ancestor of many of the Comerford families in Ireland, including the Comerfords of Danganmore, Co Kilkenny, of the Comerfords of New Ross, Co Wexford, of Edward Comerford, Archbishop of Cashel, and of Joseph Comerford, living in 1724, and who erected the Comerford memorial in Saint Editha’s Church, Tamworth, and the Comerfords of Athy, Co Kildare. FRANCIS (‘Francis I’) COMBERFORD (died 1629), is often assumed to have been a daughter Frances. He first lived at Linsell or Linshull, that is, Lilleshall Abbey, Shropshire, which had been acquired after the Dissolution of the Monasteries by the Leveson family, for whom he worked. He later settled at Bradley, near Gnosall and Penkridge, four miles south of Stafford, a parish in West Cuttlestone Hundred, Staffordshire. Erdeswick described Bradley as “a manor belonging to Lord Stafford’s barony ever since the Conquest.” Francis Comberford was probably the builder of Bradley Old Hall, which stood until 1939. Francis Comberford married Joan Brereton or Breton, daughter of John Breton of Tamworth, MP for Tamworth in 1585, and his wife Elizabeth Wyrley. Joan was descended from a family associated with Tamworth since the early 14th century. Her sister Joan was married to Francis Comberford’s distant kinsman, Christopher Endsore of Comberford, while her half-sister Elizabeth was married to John Leveson. 1, Francis Comberford (ca 1592-1648/1649), of whom next. FRANCIS (‘Francis II’) COMBERFORD (ca 1592-1648/1649) of Bradley, Staffordshire. He was born ca 1592. He became a tenant at Oxley Farm, near Wolverhampton, around 1613. Oxley was the home of the Austen family until the death of Thomas Austen in 1613. 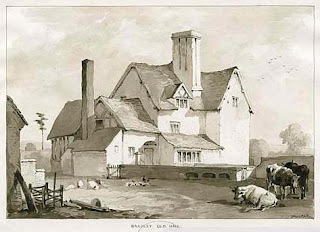 Francis succeeded his father at Bradley Old Hall in 1629. In 1632, the advowsom of Bradley was conveyed to Francis Comberford by Matthew Craddock, the first Mayor of Stafford, and his wife Elizabeth. Francis Comberford presented the Revd Jonathan Yates, BA (Brasenose College, Oxford), as the Perpetual Vicar or incumbent on 20 June 1636. In 1639, the Revd Timothy Rawlins was appointed curate. The collection of title deeds in the Staffordshire Record Office relating to the tithes and advowson of Bradley from 1632 to 1790 shows that the patronage of this living also passed from the Craddock family to the Comberford family, and later passed to the Curzon, Vere and Anson families. 1, Francis (‘Francis III’) Comberford (ca 1620-1679), of whom next. 2, Thomas Comberford (1621-1639). He was born in 1621. He matriculated at Balliol College, Oxford, on 15 November 1639, aged 18. He never graduated, but died unmarried within a month and was buried at Saint Peter in the East, Oxford, on 13 December 1639. This is a 12th-century church on Queen's Lane, north of the High Street in central Oxford. It now forms part of St Edmund Hall, one of the Oxford colleges. It has long been deconsecrated and houses the college library for graduates and undergraduates. The churchyard is laid out as a garden and contains a seated bronze statue depicting Saint Edmund as an impoverished student. 3, Dorothy, who died unmarried. ● 1a, Walter Skrymsher (ca 1660/1661-post 1680). He was born ca 1660/1661, aged 2 in 1663, an apprentice to a trade in Liverpool in 1680 and aged 20. ●● 1b, John Skrimsher (1715-post 1743), of Sratlepool, Shropshire and Burgess of Shrewsbury, living in 1743. ●● 1b, Richard Skrymsher, born ca 1704/1705, educated at Lincoln College, Oxford (BCL, 1730). ●● 2b, Robert Skrymsher, born ca 1717/1708, educated at Pembroke College, Oxford. ● 4a, (The Revd) Richard Skrimshire, Rector of Forton. He was married and had six children, five sons and a daughter, born between 1704 and 1717: Richard, Walter, Elizabeth, Charles, Francis and Robert Skrimshire. ● 5a, Mary, born ca 1672/1673, living in 1680 when she was aged 7. She married … Onion. FRANCIS (‘Francis III’) COMBERFORD, JP (ca 1620-1679). Adams identified him as the fifth son of William Comberford, but William’s grandson, William Comberford, clearly identifies him as his kinsman, and does not name him as his brother [see Comberford 5: Recusants, royal guests and civil war]. Francis Comberford was born ca 1620, and moved from Oxley Farm, near Wolverhampton, Staffordshire, to his estate at Bradley around 1648. In October 1647, Parliament added Francis Comberford to the Commissioners for Staffordshire charged with raising £60,000 a month to arm the parliamentary forces. He was a Justice of the Peace in 1649-1653, was made one of the Quorum in 1651, and is said by some authorities to have been a Parliamentarian colonel. He was one of two Justices of the Peace for Staffordshire who signed a notice on 28 March 1650 offering a reward to William Parker, tailor, of Bradley, for the apprehension of Humfrey Ellis, a “strong and desperate felon and notorious horse-stealer, who had broken gaol and was in flight from a constable.” After his capture, Ellis was tried at the next assizes and executed. Francis Comberford married on 8 June 1640 in Church Eaton Margaret, daughter of Sir Thomas Skrimshire (died 1632) of Forton Manor and of Aqualate, near Newport, Staffordshire, and his wife Anne, daughter of Ralph Sneyd of Bradwell, Staffordshire. Forton Manor came into the possession of James Butler, Earl of Ormond, in 1453 or 1454. He was attainted in 1461 as a Lancastrian, but his estates were returned to Sir Thomas Butler by Henry VII in 1485. In 1654, Francis and Margaret Comberford conveyed the advowsom of Bradley to Sir John Curzon. George Fox (1624-1691), the founder of the Quakers, was born in Fenny Drayton, eight miles east of Tamworth. In 1650 he was imprisoned for about a year in Derby on a charge of blasphemy. 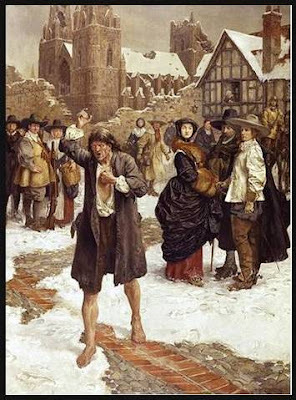 On his release in the winter of 1651, Fox, who was overwrought and weakened by six months “in the common gaol and dungeon,” walked barefoot through the streets of Lichfield on a market day, crying: “Woe to the bloody city of Lichfield!” His own explanation of the act, connecting it with the martyrdom of a thousand Christians in the time of Diocletian, is not convincing. Fox says his mother came from “the stock of the martyrs” and his protest in Lichfield may have been inspired by childhood memories of stories she told him of the Protestant martyrs burnt at the stake in the Market Square in Lichfield during the reign of Queen Mary. 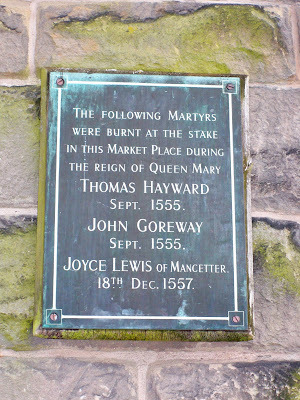 Thomas Hayward and John Goreway were put to death in September 1555, Joyce Lewes, a niece of the Protestant martyr, Hugh Latimer, was taken there from Mancetter, two miles from his childhood home – it had once part of the possessions of the Comberford family too – and was burnt at the stake in Lichfield on 18 December 1557. Fox would have heard too of the public execution in Lichfield on 11 April 1612 of Edward Wightman, the last person burned for heresy in England. In a list of Staffordshire gentry compiled in 1662-1663, Francis Comberford is mentioned as a Quaker of Bradley, and he was the only Quaker among the gentry of south Staffordshire. In the 1666 Hearth Tax records for Bradley Constablewick in Cuttlestone Hundred, he was assessed for seven hearths, indicating his house was half the size of Comberford Hall. With the death of his cousin Robert Comberford in 1671, Francis claimed the Comberford family estates which he had first leased from his kinsman, William Comberford, but was unsuccessful. Francis Comberford later moved to Shropshire, where he lived for the rest of his life. There is some confusion about the dates when Francis and Margaret Comberford died. Adams is obviously wrong when he says Francis “died before 1670.” The Visitations of Staffordshire say they both died ca 1677. However, the records of Shropshire Monthly Meeting of the Society of Friends show Margaret was buried on 18 May 1676, and that Francis Comberford died on 1 March 1679 and he was buried on 3 March 1679. 1, Mary (ca 1641/1642?-1700). She was born before 1655, and she became a Quaker at Comberford Hall with her parents in 1655. She was still living and unmarried in 1684. She lived for some time at Wolverhampton, and had moved to the Ford Gate, Stafford, by 1690. She wrote to George Fox from Stafford on 19 April 1690, addressing him as “My dear friend,” “Dear Friend” and “My dear love in the everlasting truth ...” and sending “dear love to thy wife & children.” Fox died nine months later on 13 January 1691. Mary Comberford made her will in 1699, leaving £135.16.9. She died unmarried the following year, and she was buried in Stafford on 23 April 1700. 2, Margaret (ca 1642/1643?-post 1684), She too became a Quaker at Comberford Hall with her parents and her sister Mary in 1655. She married ... Pitt, and was living in Worcester in 1684. 4, Anne (1647-post 1667). She was baptised at Bradley on 19 April 1647. She married in Lichfield, on 12 November 1667, Richard Meighim, a tanner from Shropshire. 5, Jane (1648-post 1675). She was baptised (as June) in Bradley on 30 August 1645. She married Robert Sutton in Bradley on 3 November 1675. 6, Grace (1651- ). She was baptised at Bradley on 25 April 1651. 7, Thomas Comberford (ca 1654-post 1684). He was born ca 1654, and was aged about 30 in 1684, when he was unmarried and living with a relation in Gloucestershire. 8, Hannah ( - pre-1699). She was unmarried and living in 1684. She probably died before 1699, as she is not named in the will of her sister Mary that year. Francis Comberford’s sons, Thomas and Francis Comberford, may have descendants, but I have been unable to trace them. The Quaker presence in Lichfield and the surrounding villages was less numerous. In 1655, two Quakers – Alexander Parker and Thomas Taylor – held a meeting for worship in Humphrey Beeland’s house in Lichfield. There was a Quaker meeting in Shenstone from 1654 until it moved to Chesterfield, where the meeting continued from 1669 until the 1720s. These Quakers in Chesterfield tried but failed to establish a Friends’ meeting house in Lichfield in 1703-1704. By then, the Combeford Quaker line had faded into obscurity or come to an end. 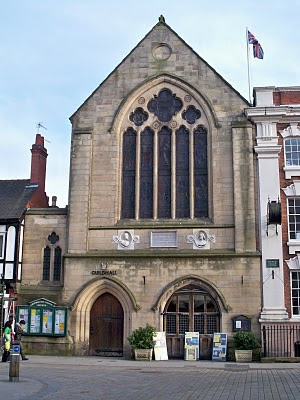 A Quaker meeting was re-established in Lichfield in 1813, but closed 16 years later. 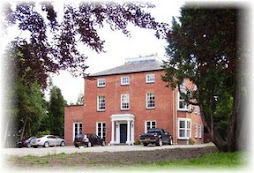 Today, there is a small Quaker meeting in Lichfield, which has been meeting every Sunday morning since 1993 in Martin Health Hall, Christchruch Lane, which is rented from Christ Church (Church of England) parish. G.O. Ms. 160, ff 102-104; Crequy Pedigree, ff 11-14. Al Cantab, 1/1, p. 432; HF Howard, Accounts of the Finances of the College of St John the Evangelist in the University of Cambridge, 1511-1926 (Cambridge: Cambridge University Press, 1955). NA, Exchequer, King’s Remembrancer, Certificates of Residence, E 115/112/96. Visit Staffs, pp 55, 142. Visit Warwicks, p. 34; Adams, p. 8. Visit Warwicks, p. 34; Shaw, p. 434 and Adams, p. 8, where both spell his name Frances). Visit Staffs, p. 142, where it is said he was the father of John Comberford, whose daughter Alice married Walter Littleton, although this is not supported by other accounts. G.O. Ms. 160, ff 102-104; Crequy Pedigree, f. 12. It should not be confused with another Bradley in Staffordshire, which is near Wednesbury but has no connections with the Comberford family. VCH Staffs 4, p. 74. Visit Staffs, pp 33, 266; Adams, p. 8; Burke’s General Armoury, p. 120. His will is missing, according to Philimore (see Philimore, Lichfield Wills (1892), p. 419). Visit Staffs, p. 54; VCH Staffs 4, p. 86; Lichfield Diocesan Records; 'Yaire-Yule', Alumni Oxonienses 1500-1714 (1891), pp. 1698-1706. URL: http://www.british-history.ac.uk/report.aspx?compid=119402 Date accessed: 06 June 2013. Staffordshire Record Office, Records of the Anson Family of Shugborough, Earls of Lichfield, Mss Title Deeds, Tithes of Bradley and Billington, D 615/D/297. Foster, Al Oxon (Oxford, 1896) 1, p. 314. See Visit Staffs, p. 54. Foster, Al Oxon, 1, p. 314; Register, Saint Peter in the East, Oxford, 13 December 1639. SHC 2/2, pp 95, 97; ‘Visitation of Staffordshire,’ SHC 5/2 (1884), p. 270; Visit Staffs, pp 205-206; Visit Warwicks, pp 266, 267, 269, 271. SHC 2/2, pp 95, 97; ‘Visitation of Staffordshire,’ SHC 5/2 (1884), p. 270; Visit Staffs, p. 206. SHC 2/2, pp 95, 97; SHC 5/2, p. 270; Visit Staffs, pp 205-206; VCH Staffs 4, p. 106. ‘Visitation of Staffordshire,’ SHC 5/2 (1884), p. 270; Visit Staffs, p. 206. SHC 2/2 (1881), pp 95, 97-98; Visit Staffs, p. 206; Foster, Al Oxon, 1, p. 1363. Foster, Al Oxon, Part 2, vol 4, p. 1304. SHC 2/2 (1881), p. 95, 97-98; SHC 5/2, p. 270. SHC 2/2 (1881), p. 98. ‘House of Commons Journal vol 5: 23 October 1647,’ Journal of the House of Commons: vol 5: 1646-1648 (1802), pp 340-342, http://www.british-history.ac.uk/report.asp?compid=25208&strquery=Comberford (28.4.2007); ‘House of Lords Journal vol 9: 26 October 1647,’ Journal of the House of Lords: vol 9: 1646 (1802), pp 494-498; http://http://www.british-history/.ac.uk/report.asp?compid=37146&strquery=Comberford (28.4.2007). William Salt Library, William Salt’s Original Collection, Archive Mss, M117. ‘Visitation of Staffordshire,’ SHC 5/2 (1884), p. 266; Staffordshire Pedigrees, pp 205-206; Burke’s Landed Gentry (1969), vol 2, p. 570; ‘Sneyd 1,’ http://www.stirnet.com/HTML/genie/british/ss4as/sneyd1.htm (1.9.2007). In 1683, Margaret (Skrimshire) Comberford’s first cousin, Felicia Sneyd, married Edward Wettenhall, Bishop of Cork and Ross and later Bishop of Ardagh and Kilmore. VCH Staffs 4, p. 106. Norman Penney (ed), The First Publishers of Truth (London: Headley Bros, 1907), p. 370. Penney, pp 229-230; Journal FHS 5/3, July 1908, p. 165. Greenslade, A history of Lichfield … ecclesiastical history, p. 157; Upton, pp 48-51; plaques on the walls of Saint Mary’s Church, Lichfield, facing the Market Square (Patrick Comerford, visits to Lichfield, latest visits, 4-5.5.2007, 13-14.8.2007, 26-27.3.2008, 4-5.7.2008, 25-25.10.2008, 19-21.3.2009, 11-12.8.2009, 3-4.3.2010, 11-13.6.2010; 26-27.2.2011, 11-13.8.2011; 25-27.5.2012). VCH Staffs 3, p. 118; Adams, p. 12. Visit Staffs, p. 54, quoting Mss Staff Peds, f. 21. Friends’ House, London, ‘Supplement to the General Meeting of Hertfordshire, Worcestershire and Wales, marriages and burials, 1675-1776, Book 1558,’ f. 23; Evans, p. 20. Friends’ House, London, ‘Supplement to the General Meeting of Hertfordshire, Worcestershire and Wales, marriages and burials, 1675-1776, Book 1558,’ f. 24; ‘Hertfordshire, Worcestershire and Wales, burials, Book 707,’ f. 5. Journal FHS, vol 17 (1930), p. 17; Journal FHS vol 50 (Spring 1962), p. 171. Journal FHS, vol 50 (Spring 1962), p. 171. Visit Staffs, p. 54; RAH Williams, ‘Comberford of Bradley, Staffs,’ Quaker-Roots-L-Archives (20.10.1998), http://archiver.rootsweb.ancestry.com/th/read/QUAKER-ROOTS/1998-10/0908913727 (14.12.2007). RAH Williams, ‘Comberford of Bradley, Staffs,’ Quaker-Roots-L-Archives (20.10.1998), http://archiver.rootsweb.ancestry.com/th/read/QUAKER-ROOTS/1998-10/0908913727 (14.12.2007). Atherton, pp 54, 58, 65, 66 n. 77; Greenslade, Lichfield … Ecclesiastical History, p. 157. © Patrick Comerford, 2007, 2008, 2009, 2010, 2011, 2012, 2013, 2014, 2015. Last updated: 27 April 2009, 15 and 17 August 2009; 20 April 2010, 16 July 2010; 25 December 2010; 12 January 2011; 30 May 2012; 25 February 2013; 3 April 2013; 6 June 2013; 16 April 2014; 12 July 2014; 27 May 2015; 2 July 2015. Was wondering if you had any information on John Cumberford (1380-1436) or his son William (1400-1472) They are my 16 & 17th GGF. William was an MP for Staffordshire, so I am fairly sure about when he lived.